A crack, a crackle and a mulchy finish brought these Crisps straight into the top league. There was no mush and they broke down at a perfect rate. These were light, crispy and fresh looking. They featured a smattering of peel edges. There was a good amount of oil boils and some were slightly hardened by oil. 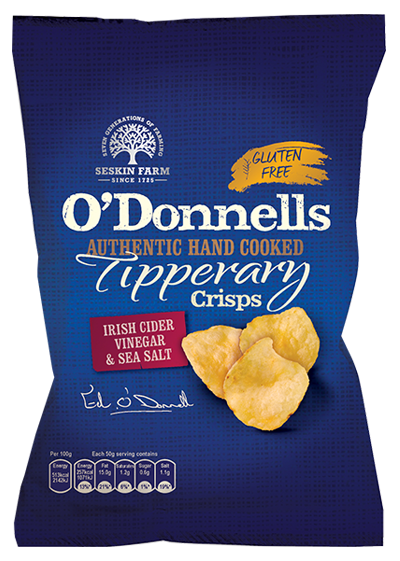 Sometimes we just help but sneak in a Chip Licka Test to our reviews and these were brilliantly Salty with a welcome hint of Vinegar. They were also unique in a reverse manner. We often experience Salt & [the more traditional] Malt Vinegar and they seem a little lacking in Vinegar; these presented us with a different challenge. There was a nice balance between Salt & Vinegar, but the fancy description actually proposed an obstacle – we did not recognise the Vinegar as ‘Cider Vinegar’. This presents a problem – we have to mark the down a point because they tasted like very good Salt & Vinegar Crisps!